Isolated by world criticism of its extreme positions and suicide bombings, as well as inheriting a severe money crunch, the Islamic Hamas faces an uphill struggle to even begin cleaning up Palestinian government. Internally, Fatah, the old rulers vanquished by Hamas in last week's parliamentary election, are refusing to cooperate with the new rulers, almost openly hoping for their failure. International donors, who have annually made up a huge shortfall in the perpetually strapped Palestinian Authority, are balking at funding a Hamas regime. Fatah leaders are expressing defiance instead of shock over their loss, after winning just 45 seats in the 132-seat parliament, while Hamas took 74, putting an end to four decades of Fatah control over Palestinian politics. "We will not allow anyone to take part in a government with Hamas," said Sufian Abu Zaydeh, an outgoing Fatah Cabinet minister. He made it clear in an interview with Israel's Channel 2 TV that Fatah is hoping Hamas falls flat in its mission of governing in its first-ever try. "They said they have a different way of doing things, they can conduct negotiations without talking to Israel, without recognizing Israel, let's see them do it," he said, while admitting that voters punished Fatah for its widespread corruption. In an interview on CNN, Hamas senior leader Mahmoud Zahar said he expected aid from the Arab world if the West stops its funding and charged that up to now, Fatah operatives skimmed off most of the foreign aid for themselves. The most immediate crisis, even before Hamas has a chance to form a government, is payday. The Palestinian Authority coffers are empty, and Israel is considering holding up transfer of tens of millions of dollars of tax and customs money it collects for the Palestinian Authority at its ports and crossings, in accordance with interim peace agreements. At the weekly Israeli Cabinet meeting, acting Prime Minister Ehud Olmert said Sunday he was making progress in organizing what amounts to a political boycott of Hamas. He said he spoke to the leaders of Egypt, Jordan, European nations and the United Nations, and all agreed with the Israeli position rejecting any contact with a Palestinian Authority made up even in part by "an armed organization that calls for destruction of the state of Israel." The Cabinet statement did not specifically mention the tax funds. The monthly average transfer of $54 million could make the difference between paying salaries of security forces and civil servants or failing to meet the payroll. Some officials favor transferring money in February while Israel examines the policies of the new Palestinian leadership. On a larger scale, Palestinian experts estimate that the budget shortfall for this year will again approach $1 billion. Up to now the deficit has been covered by Western aid, but that might stop. At a briefing in Washington on Friday, U.S. State Department spokesman Sean McCormack said the situation is "very clear. The law and policy of the United States is that we do not provide funding, money, to terrorist organizations. Hamas is a terrorist organization." The European Union issued a statement demanding fundamental changes in Hamas policy, "to renounce terror, accept Israel's right to exist and disarm." European leaders questioned whether they could supply funds to the Palestinian Authority under Hamas. Zahar told CNN alternate funding is available, though he denied that Iran gives money to Hamas. "We'll be able to open a new channel through our other Arabic and Islamic and international community, to help the Palestinian people without condition," he said. "We are looking for this money, but this money should not be conditioned." Softening the blow slightly, U.S. Secretary of State Condoleezza Rice said the international community understands that the Palestinians need humanitarian assistance. Experts say one way out would be for foreign donors to fund aid projects directly instead of going through the Palestinian Authority, but that would still leave the headache of paying salaries for security forces and civil servants. Failure to pay salaries on time could "create a mutinous military front," wrote analyst Zvi Barel in the Israeli Haaretz daily. Already Fatah field commanders are saying they would refuse to turn over their positions to Hamas, and there have already been some armed clashes between the two sides. Keeping security forces loyal is vital to Hamas success, said outgoing Palestinian Cabinet Secretary Samir Hleileh, since Hamas has no experience in governing. "The immediate problem is financial, but they also have the problem of carrying out orders in the civil and security services. 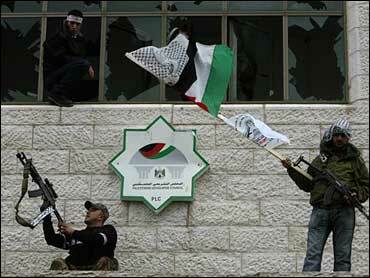 Even Fatah itself had problems in implementing orders" in the security services, Hleileh told The Associated Press.